Pex fittings come in many different brands. We prefer the Push style Sharkbite pex fittings. You can use the push Sharkbite pex fittings on all standard pex pipe. The advantage of of Sharkbite pex fittings is that no tools are required to install them. The Sharkbite push on pex fittings push on copper,pex or pvc without having to sweat or use a tool. The sharkbite push fittings save huge amounts of time with your outdoor wood furnace installation process. If you make a mistake with the Sharkbite style push fitting it is a few seconds of time to remove the pex fitting. 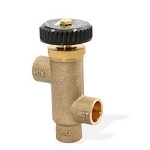 If you have metric pipe or PEX AL PEX or Kitec pex pipe then you must use a compression fitting as the compression fitting is the only style that works on or Kitec pex pipe and PEX AL PEX, Compression fittings will work with some sizes of metric pex pipe as well.